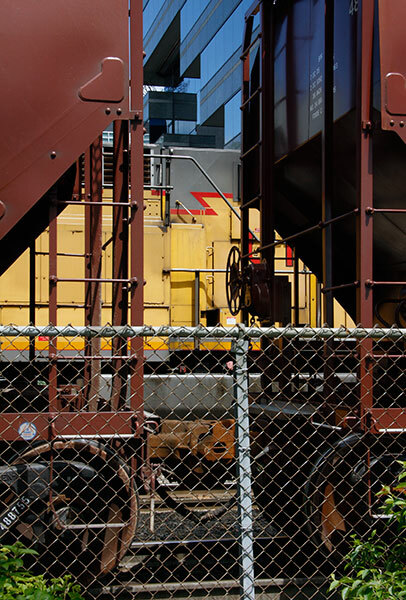 My photography in Seattle has included images of railroads and trains concentrating on detail rather than the broader view. 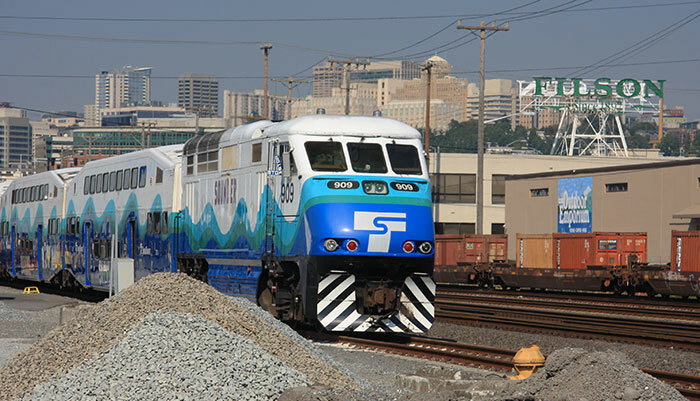 Here, Sound Transit's "Sounder" afternoon commuter trains will soon be heading south to Tacoma and Lakewood after boarding passengers at nearby King Street Station. The Safeco Field baseball stadium and a maintenance building stand beyond.. AMTRAK operate the long distance twin-deck "Empire Builder" to Chicago and the "Coast Starlight" to Los Angeles. Their "Cascades" services link Vancouver, Canada, with Eugene in South Oregon using Spanish-built "Talgo" tilting trains. Another Sounder train stands against a skyline south-east of the city centre. The usual urban America street grid enmeshes the rail tracks close to Seattle's Elliott Bay shoreline. Safe islands on a grade crossing were used in Images 1 – 3 whilst public roads and sidewalks accessed the remainder. King Street station dates from 1906 and has recently seen completion of extensive restoration work to remove the dire interior modernisation applied some fifty years later. The now pristine original plasterwork and mosaic floors plus the installation of steam era styled high backed wooden bench seating enhance an architecturally fine passenger hall. This angled frontal view reflects a long standing style in railway photography. This worked very well in steam days when large driving wheels and their associated rod machinery were important elements in a composition. Here, it also shows the notched profile of the double-decked passenger coaches. The brown and white livery relates to advertising for the 'Orca' electronic card for travel on all Sound Transit rail, light rail and express buses operated by the Central Puget Sound Regional Transit Authority. 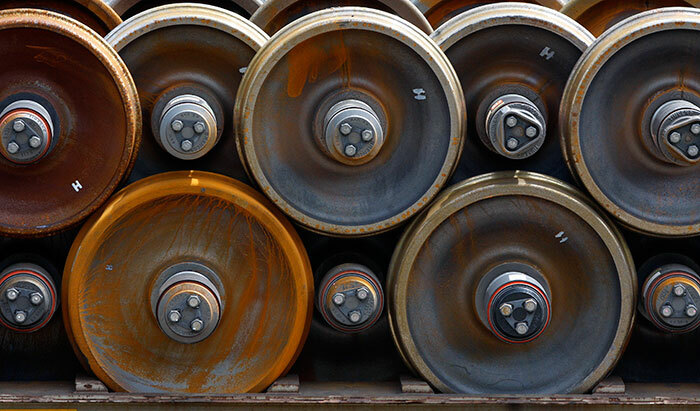 A stretch of dirt road between industrial buildings and the railroad tracks provided close access and a range of subject matter varied in geometry and colour. 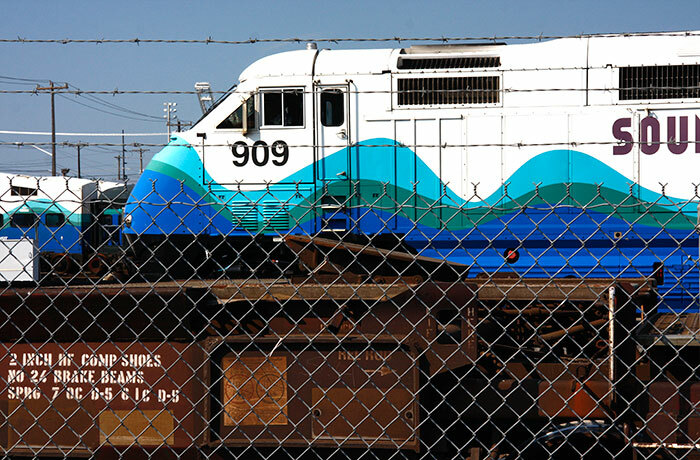 The triple blue wave form on the nose of the Sounder locomotive runs the length of the train. 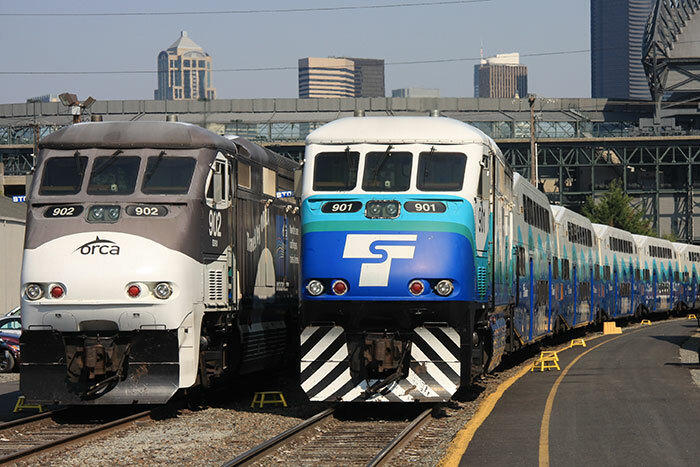 Commuter services run north from Seattle to Everett and south to Tacoma and Lakewood. The rusting flatbed freight truck and interlink wire fencing provided foreground contrast. 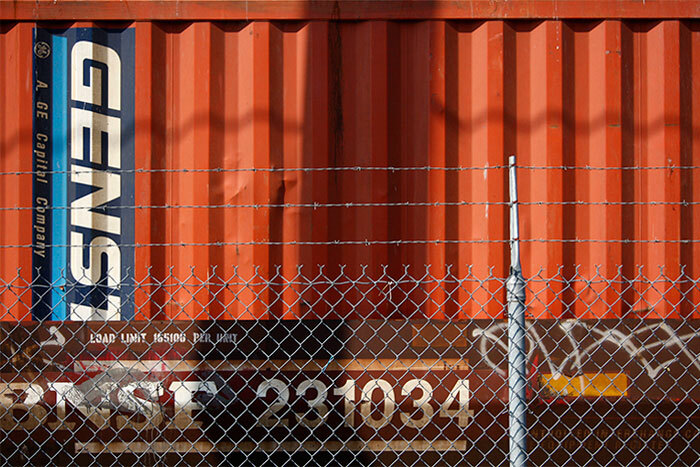 A slow-moving container train included this slightly more creative than usual imagery that's nevertheless usually unwelcome on any surface. I've seen some brilliant pieces executed in both official sites and unofficially in derelict industrial buildings and elsewhere. One of the former I know offered a meeting place on Sundays where part of the 'canvases' were the blind arches in a railway viaduct and walls of abandoned buildings. The latter have recently been demolished and the graffiti artists' future access is uncertain. This was very much a response to the line, shape, pattern, colour, texture and typography inherent in the subject matter. An image without the vandalising scribble and the fence would have been preferable: Image 02 includes an opposing and more distant view of this truck. Container dock cranes formed a high background to this area of railroad tracks, buildings and freight trains. Photographs of some of them are in the 'Structures' galleries. 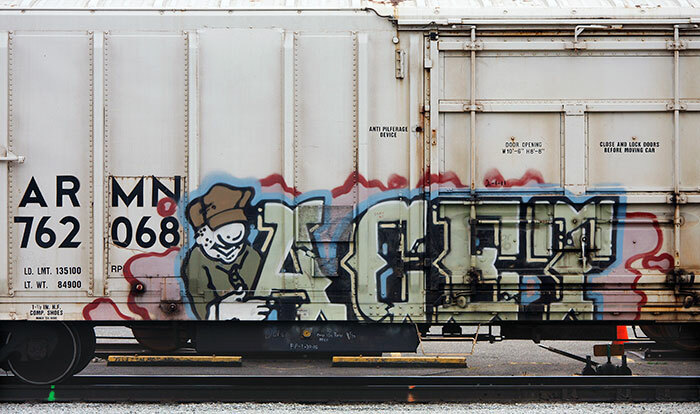 I'd been looking for images where freight car ends bracketed a fragment from their background and this was the best to emerge. 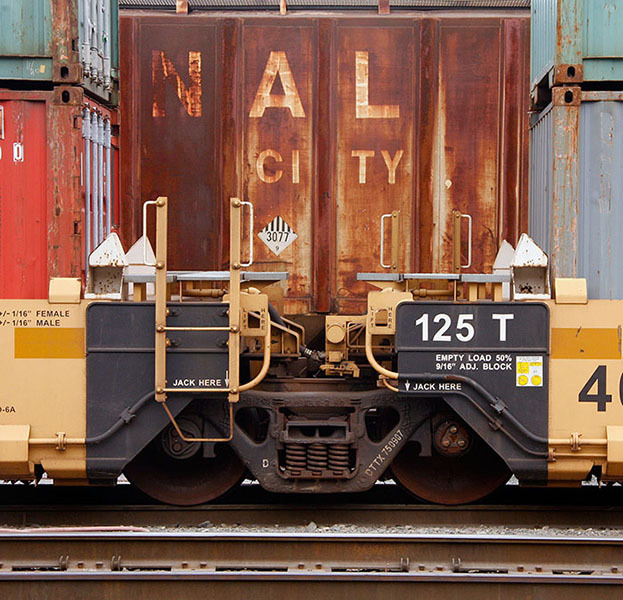 The ends of two flatbed cars in a set are carried on a single truck particularly to enable pairs of double-stacked freight containers to be carried within the wheelbases. The influence of and continued liking for this shape dates from schoolboy use of a basic Ilford box camera using 120 black and white film; long unused, it rests stored in its brown canvas shoulder-strapped case. The Soo Line Railroad, originally the Minneapolis, St.Paul & Sault Ste. Marie Railway (Sault pronounced Soo) became a subsidiary of the Canadian Pacific Railway operating into the northern USA. The combination of the flow pattern, rusting steel and graphics appealed. The quoted roof hatches and, I think, bottom doors might give clues to possible cargoes and aid speculation on the pattern's creation. The silhouetted leaf forms were unavoidable on a train parked without a locomotive and the prospect of movement to an open foreground. 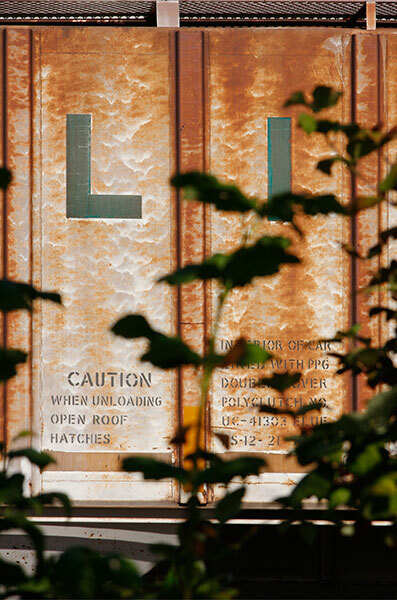 At the same site the gap between two covered hopper cars framed fragments of a locomotive and a façade detail from the building beyond. I liked the geometric shapes created and the layering of colours into the composition, but a fence-free foreground would have been preferable. An unfenced highway and sidewalk ran parallel to the tracks and this workshop. A square crop seemed a better image than the original 35mm format. 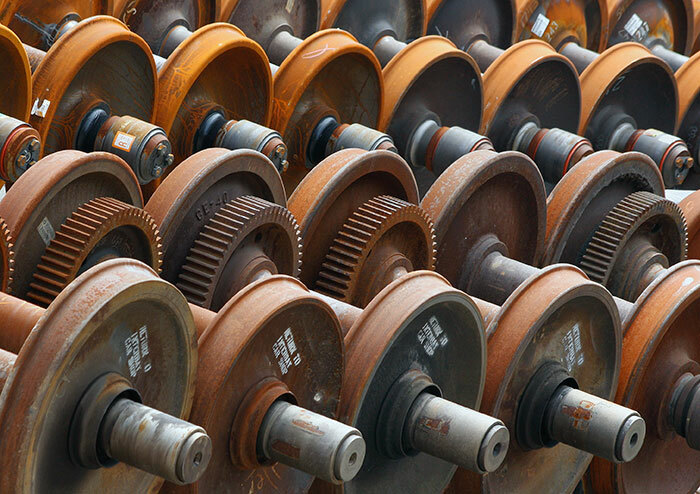 Railway workshops and related sites often provide intriguing collections of related parts, tools and equipment in random and transitory 'still life' groups. He worked with bulky early cameras to expose glass plate negatives processed in a mobile darkroom. The book, "Westward to Promontory: building the Union Pacific across the plains and mountains", contains some sixty of his graphic images. The digital photography of present day practice using prefabricated track, heavyweight long welded rail and highly mechanised laying stands in stark contrast, one that must increase one's admiration for those pioneering builders and photographers. 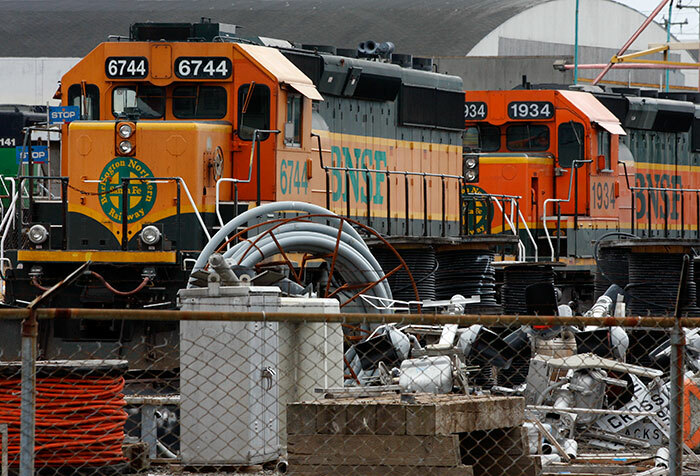 These work-worn locomotives seem ready for at least cosmetic attention. 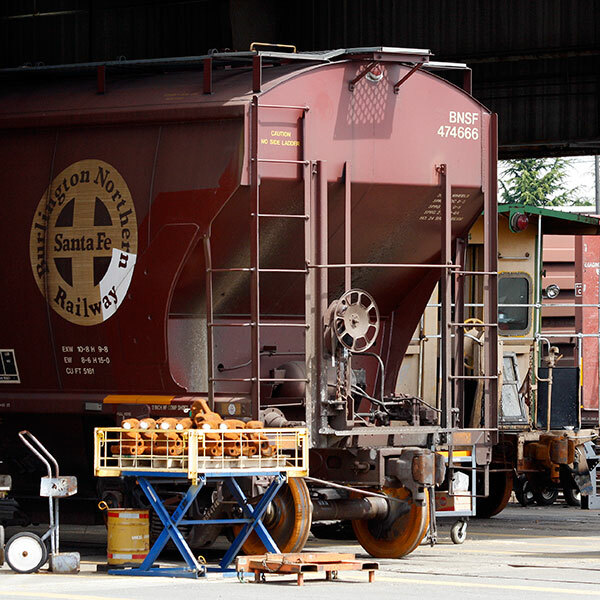 Contemporary locomotive cleaners have a much easier task than their steam era counterparts. Maintenance, operation and driving are much simpler too. For many, steam locomotives have a life and romance that diesels lack but many working railwaymen must have welcomed the change in motive power. Resting elbows on an overbridge parapet I angled the camera to frame the locomotives without including any track or background structures. Not carefully enough as an intrusion missed through the viewfinder had to be cropped out. I later wished that I'd spent more time exploring foreshortening variations: hindsight often seems to be creative. In contrast, this immaculate Burlington Norther & Santa Fe Railway locomotive may have been recently delivered by its builders. 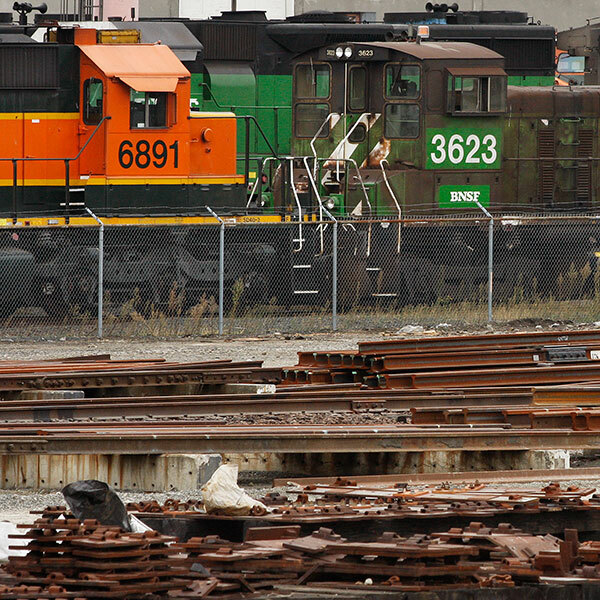 In the yard and on running lines there was quite a variety of locomotive liveries. 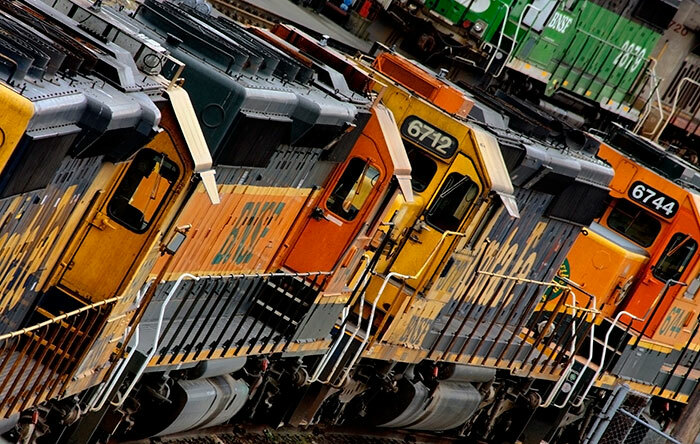 A true railroad aficionado would be able to analyse and date each one and even add the history of numbered individuals. 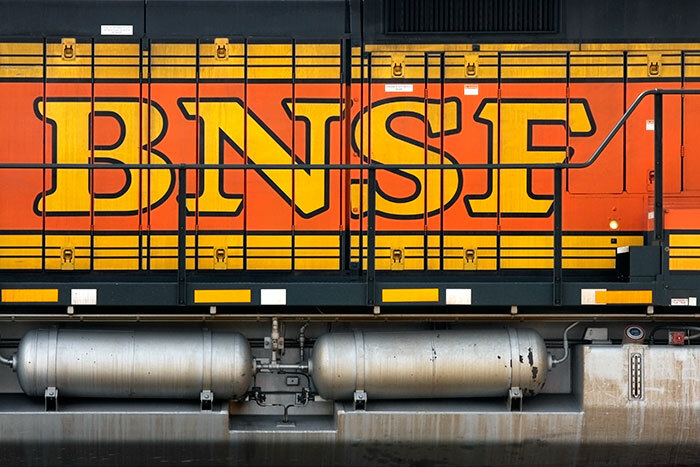 I liked the strong branding graphics and the sculptural forms of the equipment suspended from the locomotive's chassis. 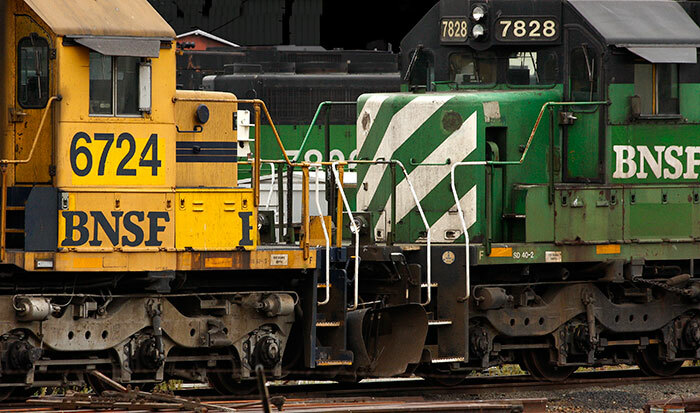 This is an earlier photograph of a mixed freight train hauled by this locomotive sandwiched between two others in a more presentable state. It was shabby and wearing a faded red on grey Santa Fe paint scheme. 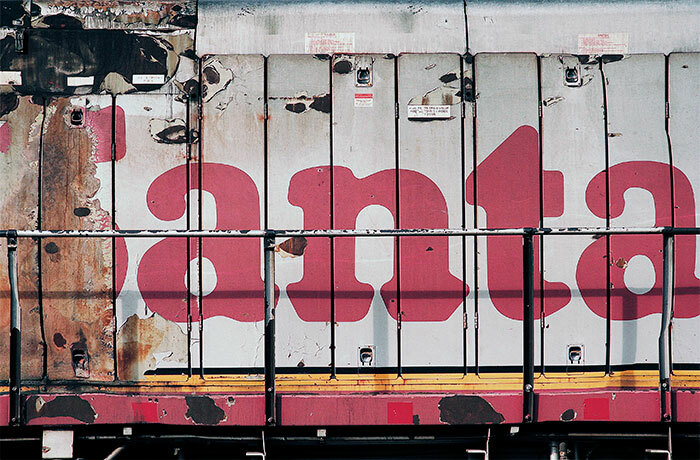 The development history of railroad graphics applied by a myriad railroad companies worldwide offers much design interest. Steam trains and the people who worked on them and their infrastructure were a part of everyday life until my departure from home as an adult. I never photographed them then as "they would always be there". Fortunately, men such as Jim Shaughnessy, Richard Steinheimer and David Plowden created life-long black and white social and engineering records of that transport age in the USA. Winston Link's project to record the demise of steam on the Norfolk & Western Railroad was a unique concept. Colin Gifford was their equal in the UK. Galleries of railway images are scattered across this website. I did begin a study of abandoned lines around where I now live but this has made slow progress. One of the stations on my childhood line was bought intact by its last stationmaster on its closure in 1964. He and his family operated it as a museum preserved as it was when trains ceased to run. They have called time and the Grade 2 listed collection of buildings and infrastructure has been offered for sale. I'd like to return to the area this year to photograph the remains of this North Eastern Railway branch line operated for over a century from 1851.